Nearly four years have passed since I last visited this glittering island. The lack of multiple security checks at military checkpoints, a facet that seemed a norm back then, immediately stands out. One thing that hasn’t change is the warmth of the locals and the smiles on their faces. 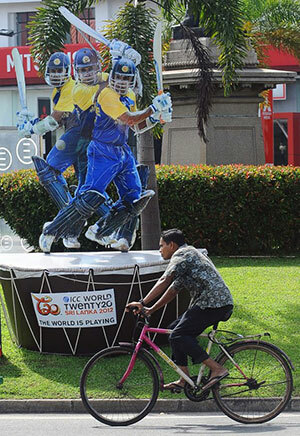 A cyclist rides past a cut out of Sri Lankan players in the capital Colombo. © AFPFrom the airport to the beachside restaurants in the south of Sri Lanka, it’s all about the ICC World Twenty20. Seaside resorts are abuzz with cricket fever, and even the cab drivers tell me they are keeping an eye on the weather forecast, praying for the rain gods to show mercy for a month. “I want West Indies to win and I believe they have a good chance,” Abhishek Bharathkumar, an Indian national and a former age-group captain for Tamil Nadu, who is here in Sri Lanka on vacation with his family, said. In addition to home favourites Sri Lanka, India and West Indies are also seen as favourites by the locals to win the trophy while Kumar Sangakkara, Chris Gayle, Virat Kohli, Shahid Afridi and Lasith Malinga appear to be the fans’ picks for the stars of the tournament. Sangakkara is extremely popular amongst the locals here, understandably so. “Kohli is my favourite player from outside of Sri Lanka. But Sangakkara is my favourite though and his three awards only prove that he is among the best in the world,” says Haroon, a shopkeeper at the airport. Teams, stats, clubs, T20 leagues are all part of routine conversations with cab drivers and at family dinners. The locals are also excited by the unearthing of unconventional talents Dilshan Munaweera and Akila Dananjaya, and the expectations for them to deliver are high. Sri Lankans are extremely confident the two players discovered at the SLPL have what it takes to succeed; many of them want both players to be included in the playing XI instead of warming the benches at this year’s T20 World Cup. With Sri Lanka known to offer unorthodox talent, the world will wait with equal interest to see if Dananjaya and Munaweera can use this platform to launch their careers similar to how Angelo Mathews did during the 2009 edition of the tournament in England. The wickets here seem to be no longer inclined to help slow bowlers or batsmen who thrive on slow, low tracks. Well rounded attacks like Pakistan’s are expected to succeed and progress beyond the Super Eight stages. “Wickets these days offer some nip to even medium pacers. I think Thisara Perera will be the player of the tournament if we go on to win the cup,” says Cathy, who is a waitress at the wonderful beachside restaurant Loon Tao in Mount Lavinia. She believes teams with allrounders who can bowl medium pace are at an advantage. A large contingent of tourists meanwhile are keen on catching the action at the India-Pakistan warm-up game on Monday. However, the overselling of World Cup tickets still lingers as a prime concern amongst many of them.A large contingent of tourists meanwhile are keen on catching the action at the India-Pakistan warm-up game on Monday. However, the overselling of World Cup tickets still lingers as a prime concern amongst many of them. “Ticketmaster, who are handling the ticket sales for the ICC, found that in the first few days of sales certain ticket outlets had access to the ‘blocked’ ticket database, and some of those tickets were sold to the public,” cheif executive of the Sri Lankan cricket board Ajit Jayasekara said, explaining the issue to Island Cricketrecently. Even with several warm-up matches out of the way, It is hard to pick a favourite to win the tournament. The wickets will certainly have a significant say in outcome of the series, and should the wickets have nip and pace, it will be a very open tournament. Three sub-continental teams made it to the semi-finals of the ODI World Cup played in the sub-continent last year, and it is hard to see others challenge them should the wickets turn out to be slow turners. Pakistan possess an impressive bowling attack, however, the chasm between sides shrinks to a blur in this format. Teams like Bangladesh can pose a formidable threat; both Pakistan and New Zealand will be wary of them, as they are in the same group. The mood is festive. The most open WT20 tournament is upon us. Sri Lanka is the place to be right now. This article was written for Island Cricket and first published there. The Question of Greatness: What does it take to be Number One? It probably isn’t unfair to say that the berth atop the ICC Test Rankings, historically, hasn’t been a paradise for teams that have scaled it. Idealists would find it easy to argue that the current and former number one teams have had questionable, if not in entirety, rises to the top – England’s failure in the sub-continent, and India’s predominantly home-series wins adding alibi to their theories. English fans, now, find themselves being stopped short of being wildly idealistic. What seems profound here is that despite victories (and draws) against tough overseas opponents on foreign soil (barring their quest in the sub-continent), England finds itself basked amidst vicissitudes of press coverage stating ‘too much cricket’ as an excuse for their exponential dip in form in the ongoing series against the Proteas. Isn’t this true for almost the entire set of test playing nations, or at least the top six nations? True, just like how the blackout in Northern India has highlighted our dependence on diesel, there have been enough presumptions with regard to England’s dependency on seam-friendly tracks. It wasn’t too long ago in the timeline when the English selectors (rather Andy Flower) had a pleasant headache over the pace bowlers they needed to leave out of an eleven being fielded. Even KP’s antics did little to overshadow the confidence that they had built as a test unit under Andrew Strauss and Andy Flower. But, isn’t it common these days to witness sparse differences in standards between teams (or if we extend this to organizations in general) vying for pole position? It is healthy, as a fan, to witness intense battles between teams that look not only strong on paper, but have the firepower to back it up on the field. A nascent advantage of the billions of cash reserves in the Middle East has been the creation of stronger clubs (through foreign ownership) to compete against the cliché of names one usually comes across in the European leagues. Chelsea, for one, given how they’d been a dominant force not too long ago under the billions of Roman and reign of Mourinho, finished sixth last season – it wasn’t ‘too much football’, but stronger competitors. Fortunately, cricket is witnessing the same. Just to drift slightly off here – as much as I’d love to call the current New Zealand team a touch below par, the resurgence of West Indies (too early to say? 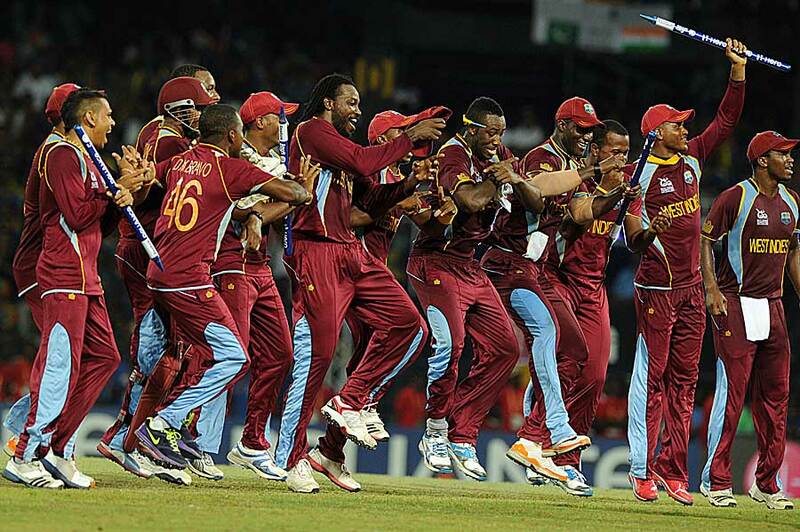 ), owing to the return of Chris Gayle at the top of the order, has been a welcome sight to most of us. In paper, they may hardly seem like teams being overworked. Chris Gayle, players competing in the IPL, WICB issues have, in the past, camouflaged substantial on-field press coverage (barring the Ramdin ‘paperwork’ during the series against England). The change in tutorship at New Zealand has received a little more space than an obituary in newspapers here. But they’re competing all right. Coming back to the perennial issue highlighted earlier – packed calendars don’t help. Agreed. Much has been written in the footballing circles about how players get jaded after a long season (domestic, league, continental competitions adding to the toll) followed by international commitments. And by the time they’re done with it, the new season beckons – it isn’t uncommon to see players who’ve undergone the wrath of such schedules sit out of contention for the best part of August. Cricket is equally, if not more, demanding in terms of fitness (probably more mental owing to the long stretches of tours away from home). Unlike football (and I’m sure football purists would disagree here), there’s very little space for error in the game of cricket – a lapse of concentration could cost a batsman his wicket, a fielder a catch and a bowler a wayward line/length. Add to all this media hype and expectations (something which I believe dearly affects teams like England and India, more than other teams around) – the end result is a volatile cocktail. So, have teams at the top been victims of everything (and everyone) but themselves? It is as much about hype and expectations, as it is about packed schedules. The modern day sportsman is trained (through a combination of well-structured training programs catering to the mental aspects of sport) to cope with expectations of a nation, and the glaring eyes of the world. But few cross the line that differentiates the best from the rest. A double hundred in a dead-rubber test on a flat wicket deserves to be dwarfed to insignificance when compared to a half century on a trying wicket that saves a test. Only when the cricketing community starts setting such standards and yardsticks, will we see the crop of players rise up and deliver. 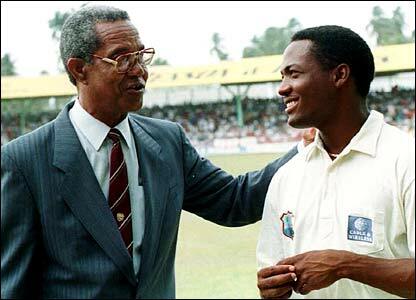 Let me recall an interesting anecdote I heard from a source (this isn’t fiction) regarding Don Bradman’s reaction, when quizzed by an Australian journalist, after Brian Charles Lara had scored a record breaking 375 against the touring Englishmen in Antigua. The Don, apparently, had replied ‘Okay’. Maybe, that is what greatness is about.